All Saints Chorus and Orchestra – Page 2 – Tickets are available on Eventbrite for both singers and audience. ASC go wild in the country! Come and support the local choir with an extremely enjoyable quiz, a fish & chip supper and raffle. Tickets from choir members in advance (because of catering), prices are £12 including fish and chips and £5 for children including chips? Contact enquiries@allsaintschorus.org. Christmas Concert. Saturday 9th December 2017 7.30pm. St. Bartholomew’s Church, East Ham. Accidental Martyrs by Jon Cullen / Bach’s Cantata 140. Saturday 21st October 2017 at 7.30pm. We’ll be singing Jon’s own composition about the Catholic martyrs of Stratford, along with Cantata 140 by J. S. Bach. Tickets: £15 full price, £10 concessions, £7 Friends. 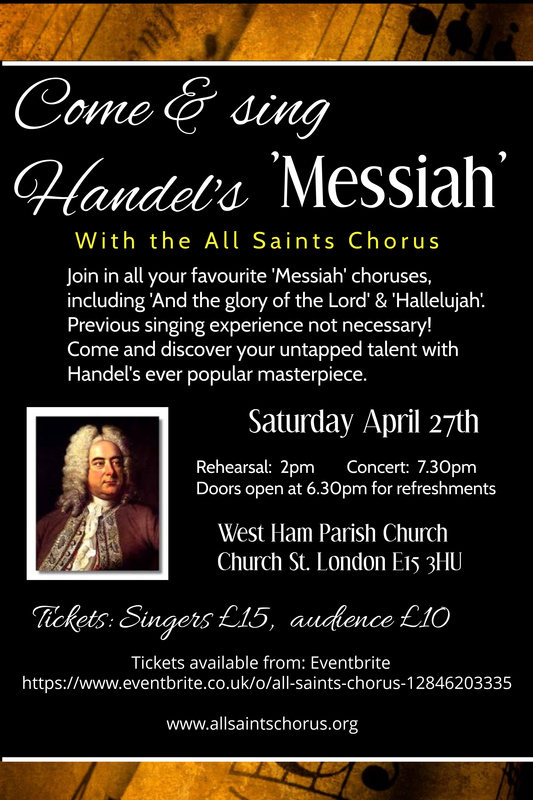 The concert will take place at West Ham Parish Church, London E15 3HU. Please come along! Fauré Requiem. Saturday 30th September 2017 at 7.30pm. St Edward’s Church, Romford. Quiz Night and Fish & Chip Supper. 7.00pm Saturday 11th March 2017. Join our Great Quiz! Bring your friends and make your own team, or join a team of friendly quizzers on the night. Help us to raise funds for the choir, all while having fun and enjoying a fish and chip supper. Adults £12, Children £5. West Ham Parish Church E15 3HU. Saint Matthew Passion by J.S. Bach. 6.30pm Saturday 25th March 2017.